(2012/COW ISLAND) 18 tracks, a fantastic solo effort of the Starline Rhythm Boys bass player Billy Bratcher paying here his tribute to the Pre-War Honky Tonk, Ragtime and Blues music! An A+ release and highly recommended!! Check also the Starline Rhythm Boys releases 'Red's Place'(CD CIM 005), 'Live At Charlie O's'(CD CIM 011) and 'The Masquerade Is Over'(CD CIM 014). 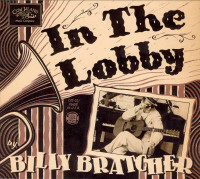 'In The Lobby' is a self-proclaimed celebration of my twenty-five years in the hotel and entertainment businesses. Most folks know me as the songwriting bass slapper for The Starline Rhythm Boys. Danny Coane, Al Lemery and I have logged a dash full of miles playing some great, authentic honky tonk music. I'm quite proud of our recorded catalog on Cow Island Music. Some have witnessed me peddling 'Hokum's Hair Tonic' with my fictitious brother 'Stick' (Woody Kepple), in our vaudeville style act, The Hokum Bros. Or perhaps in a juke joint in Texas or California with Wayne 'The Train' Hancock. From coast to coast, we had a blast...but that's in the past. Most travel these days is weekend, so I can be on the job Monday morning. The hotel has treated me fine. I have worked with some real nice people and met a ton of interesting guests. From Presidents on down, I've rubbed a lot of elbows, believe me. Don't even get me started about the time I had to assist a bellman with handling Alice Cooper's snake. A long story. Another guest I fondly recall was a fellow named Roland, a World War II vet from North Carolina and a member of the 100th Infantry Division. They called themselves 'The Sons of Bitche.' They took a valuable piece of real estate from the Germans in France, Bitche to be exact. At a reunion party at the hotel, I had the honor of playing bass in Roland's little southern hillbilly band. He said I was the most 'syncopated' cat he ever met and made me an honorary member of 'The Sons of Bitche.' I've had a 100th Infantry Division sticker on my bass ever since. 'Syncopated,' now that's a word from a different era. From a time where I envision myself as the house entertainer at The Ambassador Hotel in Chicago or the Algonquin in New York. 'In The Lobby,' where the action is. The hustle and bustle, metropolitan, uptown, big time women and a two finger pour of top shelf bourbon from the lobby bar. That's me, near the palm tree sharply dressed in my favorite panama suit, spreadin' the sound around. Bellmen snap to the 'ting-ting' call of the ornate brass desk bell elevator going up!!! Customer evaluation for "In The Lobby By Billy Bratcher (CD)"